BOGOTA, Colombia (AP) -- When the Trump administration paved the way for Venezuelan opposition leader Juan Guaido to name a new board to run the U.S. affiliate of Venezuela's state oil company, it was a rare glimmer of hope for the American families of six oil executives jailed for over a year without a trial in the politically turbulent South American nation. But a month later, the families complain they are being left to fend for themselves as much as ever by the men's employer, Houston-based Citgo, which until the takeover had been the U.S. subsidiary of the Venezuelan oil giant known as PDVSA. Citgo, the eighth largest refiner in the U.S. and Venezuela's biggest foreign asset, has emerged as a major prize in the battle for power in Venezuela between President Nicolas Maduro and Guaido, who heads the opposition-controlled National Assembly and is recognized by the U.S. and about 50 other governments as the country's legitimate leader. The families insist their loved ones are collateral damage in that high-stakes fight— first imprisoned on trumped-up charges by Maduro's government and now overlooked by a U.S. administration hell-bent on regime change while Citgo is hounded by creditors and battered by U.S. sanctions on PDVSA. Their travail began the weekend before Thanksgiving in 2017, when the six executives got a call from the head of PDVSA summoning them to Caracas for a last-minute budget meeting. Once there, armed and masked security agents burst into a conference room and arrested them on embezzlement charges stemming from a never-executed proposal to refinance some $4 billion in Citgo bonds by offering a 50 percent stake in the company as collateral. Maduro himself accused them of "treason," though they have not been charged with that crime. The families of the "Citgo 6" — five of them American citizens and all with deep roots in Texas and Louisiana — complain the men are being held in inhumane conditions, sharing overcrowded basement cells in a military counterintelligence prison and suffering severe weight loss in a country plagued by food shortages. Even worse, their case shows no sign of advancing. A preliminary hearing was postponed Friday by Judge Rosvelin Gil for the 14th time, with little apparent reason. Citgo, when under Maduro's control, provided almost no support to the jailed executives or their families despite an indemnity agreement that obligates it to act on the men's behalf. In the months following their arrest the company even terminated their pay although they were never fired. Now, the families feel snubbed by Maduro's opponents as well. Several emails and an upbeat letter sent Feb. 26 by certified mail to new Citgo chairwoman Luisa Palacios requesting a meeting to discuss the company's plans to facilitate the executives' release and mitigate the economic hardships the families have endured went unanswered, the families say. Other efforts to contact Citgo board members have also failed, including calls to vice president Rick Esser, the sole holdover from the previous board and someone the families say is intimately familiar with their plight. "I feel like they're making a complete fool of me," said Maria Elena Cardenas, who has had to apply for food stamps to pay for mounting medical bills after the jailing of her husband, Gustavo Cardenas, who had been working as Citgo's head of public relations. "It's almost inhuman not to even acknowledge receipt." The families did meet briefly in Houston last week with Guaido ally Carlos Vecchio, who is recognized as Venezuela's ambassador by President Donald Trump's administration. "Our actions have always been guided by the goal of freeing political prisoners and denouncing torture and mistreatment," said Vecchio, who fled Venezuela to escape what were widely seen as made-up charges of inciting violence during 2014 anti-government protests. "If there's one party in Venezuela that has suffered first hand human rights abuses it's us." Still, Guaido himself hasn't directly commented on the case, even when pressed by Fox Business Network's Trish Regan in two interviews last month. Much to the families' frustration, the Trump administration has taken a hushed approach that contrasts with the very public diplomatic push that secured the release last year of Joshua Holt, a Utah man who was held for more than two years in a Caracas jail on weapons charges that were also seen as bogus. Maduro's decision to break off diplomatic relations with the U.S. and the departure this month of the last American diplomats in Caracas is likely to make it even harder to get the men freed or win them access to medical care. The State Department said it continues to closely monitor the case and work through third countries to ensure the welfare of Americans while they remain in jail. Cardenas believes that Guaido, like others, has been misled into believing the jailed executives were complicit in widespread corruption by government insiders that gutted Venezuela's oil industry under Maduro. But most of the families had lived in the U.S. for years, some even before the start of Hugo Chavez's socialist revolution two decades ago, and occupied midlevel jobs removed from the high finance positions where the crimes allegedly took place. Meanwhile, Cardenas is getting desperate. 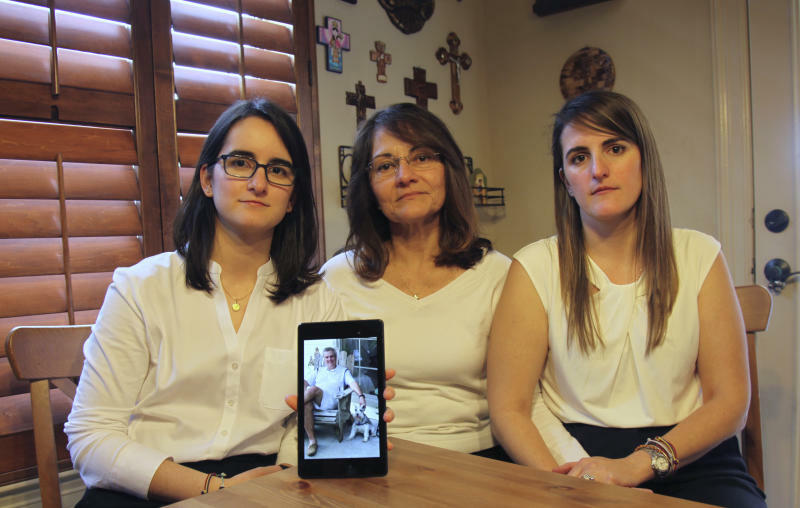 With mounting medical bills for her 18-year-old son, who suffers from a rare metabolic disease that has stunted his growth, she is looking to sell the home outside Houston where she raised three children. Without her husband's paycheck, she has to send via courier at great cost the food her husband is fed in jail_an expense that she said Citgo at a minimum should be able to pick up for the anguished families. "I know Citgo might not be able to win their release but at least they could come out and say we know they're innocent," she said of Citgo's new board. "Instead they've left us on the streets. The only thing Citgo cares about is covering its legal back."